Figure 15. 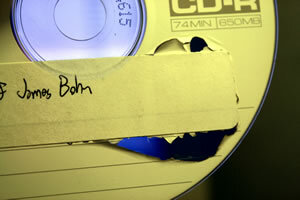 An ordinary office label was placed on this CD, which peeled up in the CD player. The surface is damaged. Figure 16. 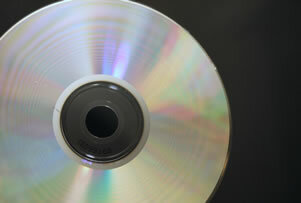 The same CD from the bottom. It is completely useless because so much of the reflective layer, which is embedded in the surface coating, has been torn off. Figure 17. This CD looks to be in pretty good condition, with a little scratchmark on the label. Figure 18. 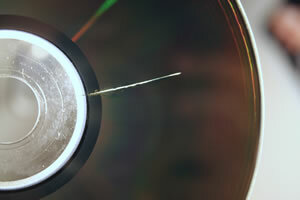 Underneath the CD, it is a crack that tears right through the file information, which is stored at the inner edge of the disk. Figure 19. 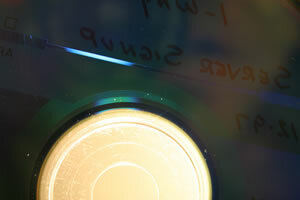 Wear on this CD is from inserting and removal, causing pinholes in the reflective layer. 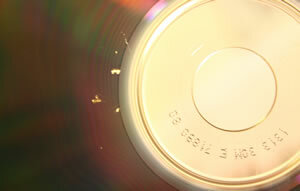 The CD was ten years old when it was retired from use. Figure 20. 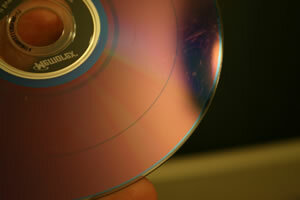 Similar damage was caused by putting the CD in its case by a woman with long fingernails. Figure 21. 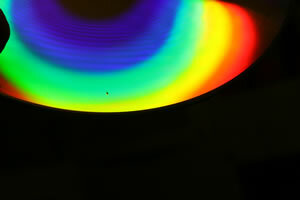 Both a directory scratch and pinholes afflict this CD. Figure 22. 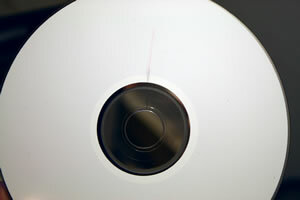 This scratch is normally almost invisible, but the CD wouldn’t read a group of files. Under angled light, the damage shows up clearly. Figure 23. Here is damage from a runaway laser. 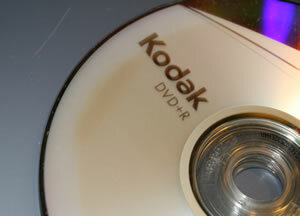 The computer or CD player apparently went into “write” mode and burned a line in the data as well as the directory tracks. Figure 24. This DVD was left in a paper window envelope in the sun, making the data unreadable. The discoloration is visible on the top surface.